Enos Cabell was one of the worst players in major league history. It’s just mind-boggling in retrospect that he was able to amass 6300 big league plate appearances. And to compound thing he was 20th in the majors in plate appearances from 1978-1980. I don’t know who it was that turned him into a 3b because he was a horrible fielder. The decision to give him 630 plate appearances in 1979 cost the Astros the Western Division, probably cost J.R. Richard a Cy Young award as well. Here’s Cabell’s 1979 line: .272/.299/.368, ops+ 87 with horrible defense at third. With Art Howe full time at third, they win the division. They also gave Alan Ashby 370 plate appearances for some bizarre reason, here’s Ashby’s 1979 line: .202/.262/.277???? The Astros won in 1980 despite playing Cabell at third, he may have cost them a trip to the WS with his .238/.273/.286 while getting 25 plate appearances (most on the Astros). Most of them are players that should have been bench/reserve/platoon players but for some strange reason were made starters for year after year. Some of them had one or two decent years but then continued playing full-time for far too long. Some of them were vastly overrated defensively. I didn’t give much thought to analysis until my card-collecting days were over, and for me it wasn’t James but Palmer/Thorn’s “Hidden Game of Baseball” — along with Thomas Boswell’s “Total Average” which Palmer/Thorn would basically argue as bogus. When we used to play whiffleball out back we’d choose to “be” any player we wanted, which for my crowd generally meant Kingman, Jackson, Rose, etc. My cousin Kevin, a Navy brat with no regional rooting interests, chose Enos Cabell. Speaking from roughly four months of experience watching the 1977 Strat-O-Matic Enos pop out or ground into one force play after another in clutch situations, I can say without any due restraint that yes, Cabell blows. I seem to recall that after several years of harping on Enos Cabell in his early Baseball Abstracts, Bill James wrote that he and Cabell had mutual friends, who had relayed some message to him from Enos. I can’t remember the details of the interaction and there’s currently an ocean between me and my copies of those old Abstracts, so I can’t look it up. Thanks for the ongoing writing, Josh. It’s always a treat to re-enter the baseball world of the late 70s. As you say, that cardboard universe sometimes feels more real than the world we wander around in. hudsongs: That story sounds familiar. I wonder if it was in the anthology of James’ writing that came out some years ago. 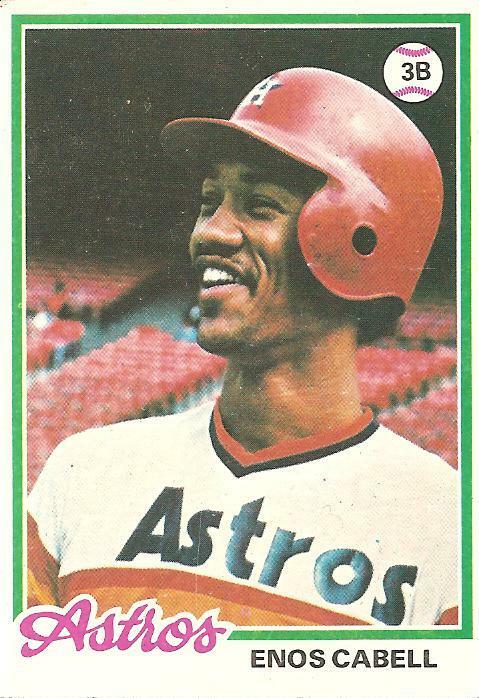 Enos Cabell may have only hit .255 in 1981, but he led the league (unofficially) in goofy smiles. As a lurker who finally was able to log in (a major achievement for me) I will leave these two inane thoughts. Enos was the second best player with that first name to play in the major leagues and he shares the same birthplace (Ft.Riley,Kan) with another of my favorites, i.e. Mr.John Damon. I should amend that Enos Cabell post. I should have said Enos Cabell was one of the worst players to amass over 6000 P.A. Some of those players had some decent years but were kept as full time starters way too long. When you talk about the worst players of all-time it all depends on where you want to put the cut/off. If your talking about 4000 P.A. Doug Flynn was one of the worst players of all time (-12)War, 4000 P.A., Dan Meyer was also among the worst ever with 9.3WAR, with 4000 P.A. But if you take it down to 3000 P.A. then the Worst all time without a doubt was Bill Bergen, A catcher during the early 1900’s hit .170/.194/.201 ops+21, in 3000 P.A. Those are his actual numbers. Dan Meyer had a negative (-9.3) career War, Bill Bergen had a negative (-17.6) career WAR. OK, Josh, because I read your book a couple of weeks ago and thought it was fabulous, I’ve started to frequent your blog. And I must say, I’ve found the blog entries to be as fascinating as the book. During this, I’ve read of your desire to write a book of the movie Bad News Bears Breaking Traning, which I’ve never saw, although the original BNBears is one of my all time favorites. So I ordered the DVD and, after reading your Cabell entry today, I felt tonight it was time to watch the movie that is inspiring your book. After watching the movie, my only response is that: I’ll never forgive you for this. Ruthven: My apologies for your lousy evening. I think maybe with that movie you might have had to have been there, and by “there” I mean nine years old in 1977 in a crowded theater full of other nine year old boys. It has definitely got its flaws. But I even love the flaws. Such is love, I guess. I think “The Bad News Bears in Breaking Training” only works if you were a 8-13 year old boy living in late 70’s. And you have to have watched the film when it originally came out sometime between 1977-1982. If you watch it as an adult today, you can’t see past the plot holes and the basic absurdity of the premise and the general lack of basic logic. But in a kid’s mind, the story seems completely plausible. It’s kind of the ultimate late-70’s boy fantasy. Fire your A-hole little league coach, steal a van, drive across country to Houston without Parental supervision, Get into adventures with your little league team along the way, stay in a motel, eat fast-food, stay up all night watching t.v., See the “Astrodome”, And Play an actual game in the “Dome”. In reality how the heck did the Bears become “California Champs”??? What happened to Buttermaker and Amanda? Even though they’re the same kids, how the heck are they all still on the same team? Wouldn’t some of the parents travel to Houston to watch their kids play? Wouldn’t Dolph Sweet’s character report what happened? Wouldn’t someone report the van stolen? Wouldn’t the parents file missing persons reports? Wouldn’t the parents be somewhat concerned that their children are travelling in a stolen van? But if you’re in junior high, all that goes out the window. I remember watching this movie when it came out on HBO during the spring of ’79. back in those days, HBO would replay movies over and over so I have these memories of watching this film 8-10 times and then going to my little league games right afterward. I think my fondness for the movie comes from the memory of being 12 years watching the movie and my biggest concern at the time was whether my 2 pieces of Bubble Yum would last an entire little league game. Haha…..I guess if you look at it as a mindless-fun movie for 10 year old kids to enjoy, it makes more sense…….but the original Bad News Bears was such a smart adult-themed comedy, that maybe its my love for the original and hoping this first sequeal was similiar, is why I was so disappointed. Anyway, after a good night’s sleep, I am over it. And on the positive side, never again will I have to wonder what I was missing by never having seen Bad News Bears sequel. The original was an excellent film that was smart and funny and worked on so many levels. Not only was it a funny film that a kid could enjoy but it was also an excellent social critique on what we value in American Society. I guess they could have made a sequel that was smart and adult-themed but that would have been harder and would have taken more money and time, etc. They could have come up with a premise that was a little more plausible though. A “California Champs” team would have been an all-star team made up of players from that league not just the “Bears” and Kelly Leak would have been the only player good enough to make an All-Star team. And Kelly Leak in reality would be playing Senior League baseball at that point. So I just look at it like a kid’s fantasy film. I actually haven’t seen the film in about 25 years so I’m going to have to look for it on DVD. I was at Big Lots this weekend, and standing in line to pay for crap I didn’t want, there on the Display of Misfit DVDs was BNBIBT — for one dollar. Each. I don’t even own a TV, but I bought three and put them in the mail to soon-to-be very grateful friends. I should have known this was how the cosmos was telling me you had a little more to say about our mutually favorite topic, Josh. Thanks. And yes, thinking about the original as a genuinely great movie and the sequel as for one for the 5th grade boys, that’s just right. Thinking about the film that completes the trilogy is not, however, recommended. For completists only. Enos Cabell is good. When I was 12, when he was playing for the Orioles, he was a guest speaker at the Towson State All-Sports Day Camp. I can’t remember anything he said, but I do remember he happily signed everything that was thrust in his face, including my Rawlings Brooks Robinson model glove. Behind that goofy grin is a great guy. Who did the Orioles get for him? I watched the “Bad News Bears in Breaking Training” over the weekend and boy was I disappointed. I hadn’t seen the movie in about 25-30 years so I had never really seen in it in the eyes of an adult. I loved the movie when I was a kid when it came out in the late 70’s but I couldn’t get over all the plot holes, the lazy writing and just a general lack of any kind of logic in the film. It was kind of like going back to your grammar school and being surprised at how small it is. Where the first film was an honest, smart, funny, and scathing indictment of what we value in the U.S., this film was just a a 30’s-40’s era kid fantasy with all logic thrown out the window. I was also surprised in re-watching it at how lazy and weak the writing and acting was in this sequel. *ENGLEBERT 2: I totally forgot they had a different Engelbert in this film. Supposedly the original grew 3 inches and lost 40 pounds so he couldn’t be used as a joke. Also this Englebert is so unathletic that it looks like he can’t even swing a ball or run. Also, about the only “jokes” in this film revolve around Englebert going to the toilet. *THE HIDDEN BALL TRICK: It’s a somewhat pivotal scene in the movie but it shouldn’t have happened. First off, you can’t take a lead in little league. Secondly, it was a BALK anyway because you can’t go to the mound with your foot on the rubber without the ball. *STEIN, OGILVIE, AND LEAK Reach PUBERTY: Little league baseball ends at age 12. Stein looks like he’s about 35 years old in this film, Ogilvie looks like he’s a Junior on the High School Chess team, and Leak looks like a high school kid sneaking out of wood-shop for a smoke. All their voices have changed and there’s no illusion that they’re anywhere near 12 years old. Kelly even says that Mike Leak gave him a bike when he was 5 and that was 8 years ago so that would make Kelly at 13, ineligible for little league play anyway. *CALIFORNIA CHAMPS: Champs of what?? They lost to the Yankees. And why would a second place little league team from Van Nuys go all the way to play in the Astrodome?? It’s never made clear in the film. *BATTING ORDER: Leak bats fourth in the line-up. He hits a 2 run home run in 3rd inning, the inning ends and yet he comes up magically in the 4th inning as the third batter down 5-3?? Mike Englebert was batting third? but in the 4rth, Ogilvie bats in front of Leak. Why would the coach pinch hit Ogilvie for Englebert? and Why would you bat the slowest player on the field ahead of Kelly Leak? and they win on a sloppy error induced inside the park home run by Carmin Ronzonni?? *SLIGHTLY RACIST: They included an Italian-American kid named Carmin not Carmine with the last name of “Ronzonni” who’s from “Back East” and steals a van somehow. Ahmad keeps worrying about “Going to the Joint” and only requires $15 dollars where the white player require $20-25 dollars. The two Mexican boys only require $2 apiece. *Sloppy/Lazy editing: It seems like the film was made during the fall/winter of 1976-1977. There’s a scene after Mike Leak takes over as the coach that’s supposed to be filmed in Houston when in reality it’s filmed in California. You can clearly see a sign for a Bellair California bank in the supposedly Houston suburb outfield. Also, it seems like the Houston scenes were filmed after the California scenes so Kelly seems to get “younger” AFTER he meets Mike Leak when they’re playing in the park. *What Happened to Amanda & Buttermaker? *WHERE ARE THE ADULTS: Where’s Councilman Whitewood? The parents are always around in the first movie are never around in this one. The Parents would just let their kids go to Texas in a van with a mentally challenged grounds-keeper? *Are they even in a little league anymore or are they just an independent team that plays pick-up games? *What was the whole point of “Calling El Paso”. *What the hell are those Texas kids chewing? Tobacco? *Why is Anheiser Bush sponsoring a little league baseball game? *How do a bunch of 12 year olds get a motel room? *Why are the Bears the HOME team, when they’re the ones coming from California? *Once the Houston police takes the van why doesn’t the fact that it’s STOLEN ever come up? *Wouldn’t the parents be notified if the Police found a bunch of 12 year olds in a motel? And wouldn’t Mike Leak contact the parents to tell them of the situation? *Mike Leak is also somewhat surprised that Kelly would be somewhat “Upset” at him. Also, by the end of the film, they’re relationship is somehow magically repaired after 8 years. Breaking Training was one of the first movies we rented when we got our first VCR. That would have been around 1985, when I was about 10. I remember pausing the credits to find out which Astros were in the film. I also remember liking the movie, but, at the time, whenever I saved up enough money to rent a video, I usually rented something involving Gallagher. gkbond: The O’s traded Cabell and 2b Rob Andrews to Houston for a 31 year old Lee May and minor league outfielder Jay Schlueter. Andrews was the kid brother of Red Sox 2b Mike Andrews, and another in the long line of highly touted infield prospects groomed in the “Oriole way” (think Bobby Grich, or the somewhat less successful Bob Floyd and Bob Bailor). Apparently, back in the late 60s and 70s if your given name was Robert and you could field ground balls, the Orioles could turn you into a phenom. Enos Cabell is always “good” in my teenage baseball fan and card collector’s book. Excellent name: CHECK. Cool card: CHECK. Played for a team with a cool uniform: CHECK. Got some key hits against my Phillies: CHECK. Made one of the most memorable boners I’ve ever witnessed in person: CHECK. The Astros were playing the Phillies at Veterans Stadium. Cabell was in rightfield. Someone hit a line drive to him. He took it on one hop and geared up to throw home to catch a Phillies’ player turning third. He must have lost his grip. The ball went right into the ground, about 5 feet in front of him. It rolled into the infield. When you’re a kid entranced by all the unexpected things that make baseball special, what’s better than a guy named Enos Cabell dressed like a fast-food employee, throwing a hard grounder from right?